DESPITE THE RUSH to cell-phone and iPod downloads as the art form of the 21st century (Look!Sayid and Jack from Lost on a 2-by-1-inch screen! ), I cling to the primacy of print as the best of all possible presents. Not only do you give something with plenty of shelf life, but you can support your local independent bookseller in the process. While we're busy remaking the Middle East, it might be a good idea to explore the deeply rooted institutions of the region. Forgotten Empire: The World of Ancient Persia, edited by John E. Curtis and Nigel Tallis (UC Press; $49.95), charts in astonishing color photographs the art of the Achaeminid Empire, which reached its peak at Persepolis and occupied much of the Middle East from about 550 to 330 B.C.E. The early Persians contributed as much to our notions of democracy as the Athenian Greeks (who have always gotten better press in the West). The Persians, for example, were "able to accommodate existing political habit without the need to enforce change" throughout their far-flung provinces," notes one of the book's essays. The meatiest art book of the season, New Art City: Manhattan at Mid-Century by Jed Perl (Knopf; $35), skimps on the pictures (all small, all black and white). But Perl, art critic for the New Republic, fills his pages with chewy ideas about the grand sweep of post-World War II artfrom Abstract Expressionism to Popas the product of both the wealth and creative ferment of New York, the only world metropolis not ruined by the war. Perl is especially good at analyzing the less-well-known artists (Fairfield Porter and Donald Judd) who followed de Kooning and Pollock. Among the many surprises is that actor Robert De Niro's father was a major figure in the New York art scene in the 1940s, '50s and '60s. A lot of the pictures that matter in Perl's book are blown-up and analyzed in Imagining America: Icons of 20th-Century American Art (Yale University Press; $49.95), by John Carlin and Jonathan Fineberg. Taking some of Perl's themes and expanding them to the country as a whole, the authors examine the methods and motives of Georgia O'Keeffe (doyenne of the desertscape), Joseph Stella (embracer of urban chaos), Pollock (pioneer of the psyche) and Andy Warhol (purveyor of pop culture). Imagining America functions as a companion volume to a PBS series set to air in late December. Taking its cue from the fluid dynamics of the documentary, the layout is jazzed up with full-bleed images, fragments of paintings arranged like film strips and plenty of multicolored pull quotes. Now lost in Mary Cassatt's wake, Cecilia Beaux (1855-1942) was once dubbed "not only the greatest woman painter, but the best that has ever lived" by William Merritt Chase. She finally gets her due in Cecilia Beaux: A Modern Painter in the Gilded Age (Rizzoli; $49.95), a lovingly detailed and illustrated biography by SJSU professor Alice A. Carter. Beaux's curse was to have been born too soon to catch the Impressionist wave. She made her living doing commissions, and her portraits of statesmen and assorted big-wigs look stiff and dutiful, but her more intimate subjects are painted in a looser style with joyous swirls of paint for blouses and drapes, and some backgrounds that verge on the abstract. Portraits of a very different kind predominate in the work of English artist Lucian Freud. In a large-format collection of his work from the last decadeLucian Freud, 1996-2005 (Knopf; $75)we see both close-ups and full-length nudes rendered with a heavy, paint-laden brush. For Freud, gravity is ever present, pulling haunches, muscles and thick rolls of flesh back to earth with the weight of care and contemplation. Especially interesting are the small head shots using the roughest of brush strokes, and a frontal image of a horse (Grey Gelding) that gives the animal a full ration of psychological insight. Bravely, or perhaps foolishly, Andrew Parker Bowles (Camilla's ex) posed for The Brigadier and ends up looking every bit the dissipated aristocrat, with a medal-bedecked uniform coat unbuttoned to reveal a gut sagging with regret for empires lost. With an inspired titleThe Stewardess Is Flying the Plane! 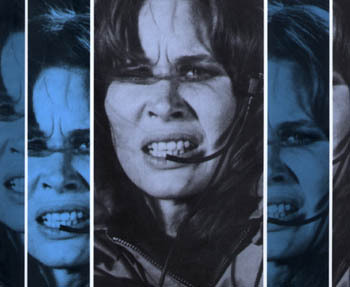 (vide Karen Black, Airport,, 1975)and hundreds of stills, Ron Hogan's history of American moviemaking in the 1970s (Bulfinch; $27.95) is designed to make any film fan of a certain age whimper with nostalgia. The 1960s brought us the counterculture, but the revolution didn't hit cinema until the '70s (as Peter Bogdanovich points out in an introductory interview), and for a few years, until the blockbuster mentality of Jaws clamped down, American movies frothed with fresh ideas and techniques, from Altman and Coppola to Bogdanovich and Demme (a still from the latter's women-in-prison classic Caged Heat might make Hannibal Lecter rethink the idea of life imprisonment). The obscure movies resonate the best: Who wouldn't kill for a revival of John Coney's Space Is the Place, a 1974 blaxploitation take on Bergmanesque existentialism starring Sun Ra? Perhaps the most chilling still is a washed-out image from Terrence Malick's Badlands showing the capture of runaway killer Martin Sheen and his girlfriend, Sissy Spacek. The movie eerily resembles the recent case of the 18-year-old boy (Christian home-schooled no less) accused of murdering his 14-year-old girlfriend's parents; the pair then headed west, evading a police chase until bumping into an Indiana tree. Talk about life imitating art32 years later. From the November 30-December 6, 2005 issue of Metro, Silicon Valley's Weekly Newspaper.